Do I even have to say what’s wrong here? When you decide to show one’s bigoted arse, it’s appropriate to express regret - not grudgingly force out an apology with the attitude that someone is holding a gun to your head. “Taken offense” and “read it as” are also classic weasel words blaming those harmed, suggesting it was an active choice on their part and not a cause of their terrible terrible actions. Ooooh, catch that use of “Lifestyle” folks - that’s 1990s pejorative language still clinging on into 2016! Honestly this is ridiculous - absolutely no-one has the excuse for still using this term and it’s further ludicrous that a magazine that claims to advoate for youth. It is appalling and frankly horrifying that an organisation purporting to represent young adults, their books and use of libraries to be so horrendously ignorant when it comes to LGBTQ people - especially considering the vulnerability of LGBTQ youth. They are grossly unqualified to do what they claim to do - they are DANGEROUSLY unqualified to do what they claim to do. This is like a journal and guide to psychiatry services being run by the Scientologists. Their ignorance is not just vexing and damaging but means they absolutely cannot perform the role they’ve assumed. Of course, a goodly portion of this “apology” focuses on their precious reputation - remember folks, if your “apology” focuses more on you than the people you hurt then you’re doing it wrong. 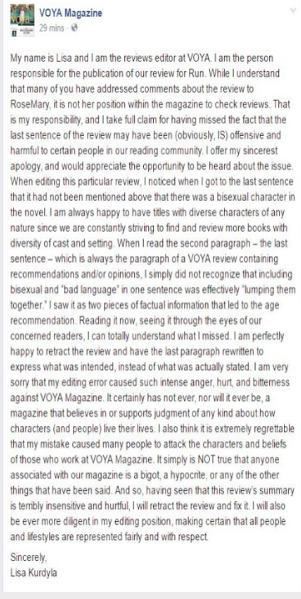 To be clear, there are very good reasons to mention the presence or lack of GLBT characters in a book review. You will note that each book review that appears on Fangs for The Fantasy, we always note whether or not there are LGBT characters and what the representation is like. We make a special point of mentioning whether or not the novel in question has a LGBT protagonist. We do this not because we think our readers need to be warned about GLBT people but because real diversity and real representation in reading material is important. We do this to highlight the few times that LGBT people who are a marginalised group actually appear in the genre, in the hope of encouraging more authors to write more inclusive stories. When marginalised groups are systematically erased it dehumanises them and sends the message that their lives, their stories, their dreams aren’t worthy of consideration. In short we are saying socially that they do not matter. LGBTQ people often grow up with few represenations of themselves around them - they cannot guarantee that they will be born in a family with LGBTQ members or have any mentors, friends or peers who are LGBTQ around them. An LGBTQ young person can easily grow up knowing nobody like themselves. I know I did and it wasn’t until I was in my mid-teens that I found a (really terrible and offensive) book with a person like me in it. Media - books, television, games, music - can provide a desperate lifeline to these young people to tell them they’re not alone which is why it is not only important that our youth can find books with people like them in them - but that we actively work to put those books in their hands. Our approach is quite different from that which Voya magazine took. To actively warn readers that they might come across an GLBT character suggests that there is something inherently wrong with these characters and that people need protection from exposure. It actively undoes any good work the author may have accomplished by attempting to tell a more inclusive story. It’s an insult to LGBT people and their allies, as well as readers who seek a story which explores and embraces diversity. Furthermore, the very idea that GLBT people are toxic to youth is homophobic because it suggests that LGBT people are somehow predatory and or a force of corruption. Such a notion ignores the fact that there are LGBT and straight/cisgender youth who could very much profit personally from seeing diversity in their reading material. 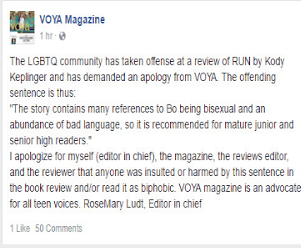 In short, by warning about GLBT characters Voya clearly marks itself as being on the wrong side of history and justice. These books cannot be treated as “adults only” when so many of our youth are so isolated and lost they don’t survive to adulthood.